Sunnyside Farm is our family homestead located in the quaint town of Vermilion, Ohio. We offer over 5 acres of peaceful agri-tranquility. Our family feels called to share our land and its four-legged inhabitants to assist others to be their very best and reach beyond their limits. 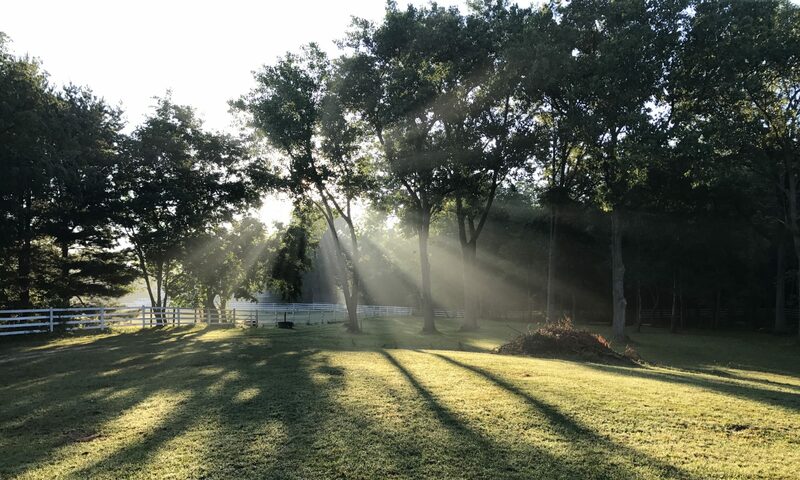 Our farm has acres of pasture, natural flowing Brownhelm Creek passing through, Riding Arena, Picnic Pavilion and other amenities to make your retreat experience productively peaceful. We host immersive half-day (approx. 4 hours) experiences for individuals and groups in leadership roles in all facets of life. We welcome anyone interested in learning more about themselves through equine interaction. The following is just a sample list of the many retreat experiences we offer at Sunnyside Farm, LLC. Other services available include: Fundraising and Campaign Consultation, Strategic Planning Facilitation, Enrollment and Recruitment Services, Public Speaking Engagements. Our program caters to those without previous horse experience. We are not a riding program, mental health therapy program, or counseling service. Leadership is too often synonymous and interchangeable with personal ambition. Without understanding how we communicate, we are unable to truly inspire others in a unified purpose. It is our mission to provide a unique and meaningful retreat experience for all our guests. Horses are mirrors and can help us see deep inside ourselves. During all of our retreats they are the instructors. We consider interacting with 1,000 pound animals and earning their trust to be a privilege. It is a profound experience that we wish to share with others. Using my personal Unexpected Path to Sunnyside Farm as a guide, we use equine interaction, reflection, discussion, and journaling to inspire a deeper understanding of ourselves. Our goals are to improve our relationships with others, identify our unique gifts and strengths, and improve our interpersonal communication skills. Together, we will learn how to nurture a deep relationship of trust within ourselves and with our peers (Human and Equine alike). Our ideal group size is between 4-8 individuals, but we are able to accommodate larger groups as needed. We provide refreshments and will work with you and/or your group on meal options depending on the time of day your retreat is scheduled. All retreats will involve a planning meeting prior to the retreat day to establish goals, discuss activities and schedule and coordinate other special needs. Every retreat is customized to fit the individual or group in attendance, so that each experience is personal and unique. Oreo was our first mare (joined now by Bentley). She is the queen and diva of the herd. She too came from Pennsylvania with Dude. She is our largest horse in terms of stature and is about 20 years old. Oreo often needs time to warm up to strangers and requests. Her boyfriends protect her very well and she loves their attention. Thunder is 15 years of age. He’s the alpha male of the herd. He came to us via Beach City, Ohio. Thunder would be enjoying a successful career on the show circuit but unfortunately, he has a bone chip in his front knee. He is the ideal trail riding horse and has many great years ahead of him. He’s always thinking and you would be surprised the many locks, latches, and doors he can open on his own. Bentley is the newest and youngest member of our herd. She is a 10 year old Palomino. Her personality is as unique as her color. To our sorrow, Sinpae passed away late last year. We serve his memory with our mission. He was a part of our original group of three rescued and brought to our farm. His Uncle Buff (Buffalo Hunter) and father Buck (Buckaroo) were the others. Sinpae now joins Buff and Buck; they were my original teachers and they will forever be remembered. Hello! My name is Mike Gocsik. I am a former private school administrator and development professional. I have over two decades of experience working for non-profit organizations and schools. I have facilitated many retreats; I am also a writer, story-teller, and public speaker. Let my Unexpected Path to Purpose & the natural beauty of Sunnyside Farm inspire your leadership journey! Since moving to our farm five years ago I have grown fascinated by the power and intelligence of horses. The trust developed and earned between horses and humans is a dynamic relationship that has been a tremendous gift to me. It is a gift I want to share with others. We live in a fast-paced and frenetic world and we all have so much going on in our business and personal lives. I am offering you and your team a break. A break from your office environment, your home life, to spend a few hours with me on the farm. There is something special that takes place when guests visit our farm and interact with our incredible equine teachers. Our farm has an incredible story and I look forward to you adding your own personal chapter to our story soon!